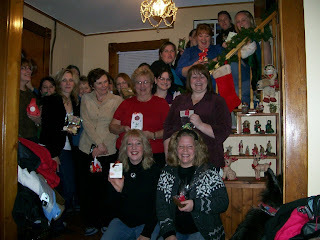 The Serene Stamper: Christmas in July & Candles! Christmas in July & Candles! The winner of my first ever "Blog Candy Giveaway" is Shelly B! Way to go Shelly! (The winner was chosen through www.random.org). Thank you all for your comments - they were all so great to read. Each and every one of you touches my heart. I'm glad you're enjoying my blog. I've been posting for almost a month now - hope it brings you inspiration in some way, shape or form! This candle and card set is a gift I made for my sister Jenna when she had her baby. The stamp set is now retired (I love it and still use it all the time!). These candles are so easy to make and SUPER fun! I will be demonstrating this technique at my stamp clubs this month - and of course, everyone will be making a coordinating card too. Here's another candle, using "Light Unto My Path" stamp set. I really like this stamp set. As you'll notice, I place my finished candles in a cellophane bag (available through Stampin' Up!) and tie with ribbon - I think this makes this gift a lovely presentation for the lucky recipient. Yup. You read right. I will be having a "Christmas in July" event and there's a reason I'm telling you about now, in April! Those of you that attended my annual "Christmas Cookie Exchange" will recall that I asked for you to bring your cookie recipes so that I could compile them and give you each a copy....which you haven't gotten yet. That's because I'll be using the cookie recipes for the invitations that will be going out for the "Christmas in July" event.....see, there's a method to my madness. I just wanted you to know I've not forgotten about the cookie recipes! 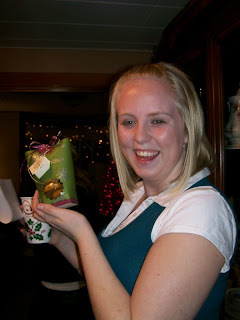 And I just couldn't resist posting this photo of Katie - as she presented each person's cookie package for the photographer....such a "Glamor Girl".... LOL Katie, you make me smile. Katie show's off Trish's cookie container. For those of you that don't know about this fun & crazy event - each year I host a Christmas cookie exchange and each guest stamps their own packages for the cookies for each person to take home. Because we had so many friends participating, we only packaged up 4 cookies per person - in other words, each lady rec'd 4 cookies from EVERY person. That was a lot of cookies! There were also extra cookies too, which I packed up and took to the "Serenity Cove" seniors home. Timing was perfect as the seniors were having their Christmas party the following day so they really appreciated our goodies! What a great idea!! How DO you come up with all these wonderful things? Oh Christmas in July.........do we all have to decorate ours houses and outside? Great Idea..........can't wait...are we going to have cookies ? Great Job.........I keep checking in each day....just to see what is new...keep it going..